Very ornamental and excellent landscaping trees, Arbtus are a long lived small to medium tree that have been grown in Australia for many years. Commonly known as the Madrone, and also Irish Strawberry Tree, a number of species and a few cultivars are available in Australia. Arbutus are a tough evergreen tree suitable for most gardens. These are a drought tolerant tree that come in three main forms suitable for the home garden. A. unedo, A. canariensis and A. x andrachnoides. The cultivar Arbutus pink pearls is a form of A. unedo. The Irish Strawberry name comes from the fruit, however it is the foliage, flowers and bark that make this an outstanding garden tree. 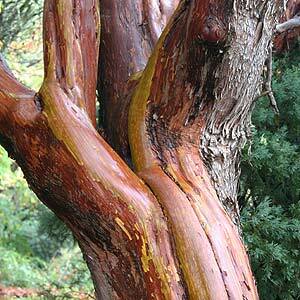 In particular the peeling bark of a mature specimen looks wonderful especially when wet. The foliage is a deep green and attractive year round, and the small white flowers remind us of Lily of the Valley, although some have pink flowers. With outstanding bark colour these are a great feature plant in the Australian garden. Native to warm temperate regions of the Mediterranean, Western Europe, and North America. A. unedo – Small tree to around 6m with a similar spread. Glossy green foliage, white flowers in winter to spring followed by red fruits. A. canariensis – This is the Canary Island Madrone, green to white flowers on a small tree to around 5m in height. Arbutus x andrachnoides – White Lily of the Valley type flowers on a small tree to 6 metres. This is a hybrid variety and is sterile. Arbutus Pink Pearls – A smalol tree with pink flowers and a very attractive cinnamon coloured bark.